I like to crochet when we go on a road trip and this road trip took 13 hours. Plenty of time to get a few projects finished. Crochet in the Round – Start with a circle, increase each round. Double Crochet (dc) – yarn over (yo), insert hook, yo, pull through stitch, (there should be 3 loops on hook) yo, pull through two loops on hook, yo pull through last two loops on hook. Half Double Crochet (hdc) – yo, insert hook, yo, pull through stitch, yo, pull through all three loops on hook. Single Crochet (sc) – insert hook through stitch, yo, pull through stitch, yarn over pull through 2 loops on hook. Slip Stitch (sl st) – insert hook, yarn over (yo), pull through stitch, pull through the loop on hook. Increase – crochet 2 times in the same stitch. Yarn – I used Bernat Maker Home Dec yarn in Clay. Hook. – I used a 5 mm hook. I linked materials to Amazon, it is always nice to keep these items on hand. My blog contains Affiliate Links. When crocheting for the beach you should use 100% cotton because it’s durable. I’m going outside the rules because I love this material. Be a rule breaker. Chain 4, sl st in chain 1 making a circle. Double Crochet (dc) 12 stitches in the center of the circle, pull tail to tighten. These will be continuous rounds. Mark your first stitch with a stitch marker. Work 2 double crochets in each stitch. At the end of the round, you should have 24 stitches. *1 dc in the next 3 stitches, 2 dc in next stitch (1 stitch increased); repeat from * to end of the round. You will finish with 60 total stitches. *1 dc in the next 4 stitches, 2 dc in next stitch (1 stitch increased); repeat from * to end of the round. You will finish with 72 total stitches. *Dc in the next stitch, chain 3, skip a stitch, dc in the next stitch; repeat from * to end of the round for a total of 36 stitches. *Dc, chain 3 then dc in the middle of the two posts; repeat from * to end of the rounds. Each round 36 stitches. *Work 2 dc between each post; repeat from * to end of the rounds for a total of 72 stitches. slip stitch. Chain 1. Dc in each stitch around. Slip stitch. Chain 1. Hdc in each stitch around. Slip stitch. Single crochet in each stitch around. Slip stitch. Ch 80 for the strap; slip stitch in the 35th stitch from your chain. Double crochet the chain then slip stitch to join skipping a stitch on the other side. Half double crochet along the strap then connect to the bag continuing along the top of the bag around. Single crochet along the strap continuing along the top of the bag around. Slip Stitch along the strap continuing along the top of the bag around. You will need the other side of the strap to match. 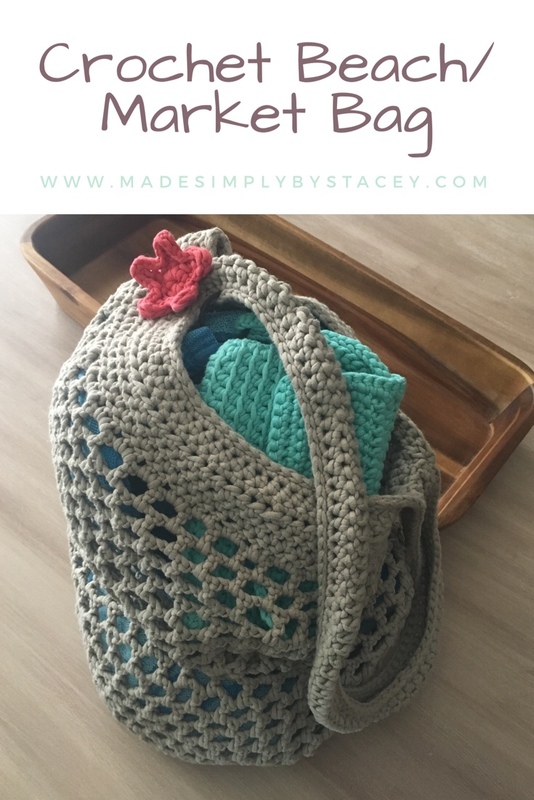 Connect to the other side of the strap and half double crochet around the strap continuing along the top of the bag, single crochet around the strap and top of the bag then repeat with a slip stitch. I added some character. I made a wristlet keychain and attached a starfish. You can call it a flower, I know it looks like one. Not everyone has the time or the energy to DIY so I am offering some of my projects for sale. Check out my Etsy Shop at Made Simply by Stacey. Free pattern Crochet Keychain Wristlet. Subscribe to my blog so you can be notified when I post something new. I want to learn to crochet just so I can make this bag!! I bought one from Amazon and I love it but if I could make it, that would be amazing! Crocheting can be addictive. A lot of people learn off youtube. I want to put some beginner tutorials on here eventually. love this! have been wanting to learn to crochet! Love this. Will have to make my own sometime! I can’t wait to make this bag. I love Bernat Home Dec yarn and I’m always looking for patterns so that I can use it! I think I have some turquoise in my stash! I love this yarn as well, I make a lot with it. I made two of these bags for myself, I love them.